HOLLIS – Lisa Schmalz, a sales associates affiliated with the Coldwell Banker Residential Brokerage office in Bedford, have been awarded the National Association of Realtors Green Designation, the only green professional real estate designation recognized by NAR. Schmalz, a Hollis resident, achieved this prestigious designation after completing two days of course work and passing accompanying exams. 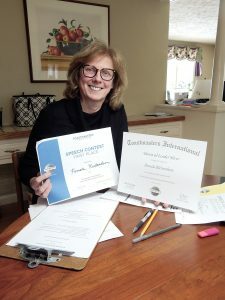 Schmalz’s colleague, Cheryl Liss, a sales associates affiliated with the Coldwell Banker Residential Brokerage office in Bedford and a Merrimack resident, was also awarded the designation. The designation provides real estate agents with comprehensive knowledge about green homes and buildings and issues of sustainability in relation to real estate. As a part of the course, Schmalz was trained in understanding what makes a property green, helping clients evaluate the cost/benefit of green building features and practices, distinguishing between industry rating and classification systems, listing and marketing green homes and buildings, discussing the financial grants and incentives available to homeowners and helping consumers see a property’s green potential. For more information about buying or selling a home, contact Mike Keeler directly at 848-9559. The Coldwell Banker Residential Brokerage office is located at 166 Route 101.